Get your motor running, head out on the highway – and download some software. Apple’s big iOS 7 update is now available to all, or at least to anyone with an iPhone 4 or higher, iPad 2 or above, iPad mini or 5th generation iPod touch. The big question will be whether people are as quick to update to iOS 7 as they have generally been with less extreme mobile OS changes from Apple. iOS 6.1 and 6.12 both saw very fast adoption rates from users in U.S. and Canada, according to Chitika, and generally speaking, Apple iOS device owners switch over to the newest OS version pretty quickly, thanks in part to Apple’s update mechanism which pushes new software over-the-air to all devices at the same time, regardless of carrier. iOS 7 is different because of how much it changes everything. The look of the OS is entirely new, from the ground up, and there are also many differences when it comes to how features work and what’s involved in navigating around your device. As I noted in my review, iOS 7 is definitely going to take some getting used to, even if the changes it implements are mostly very much for the better. To get started with your own update, check the “General > Software Update” section in your iOS Settings for over-the-air, or plug into a computer with iTunes installed to get it wired. 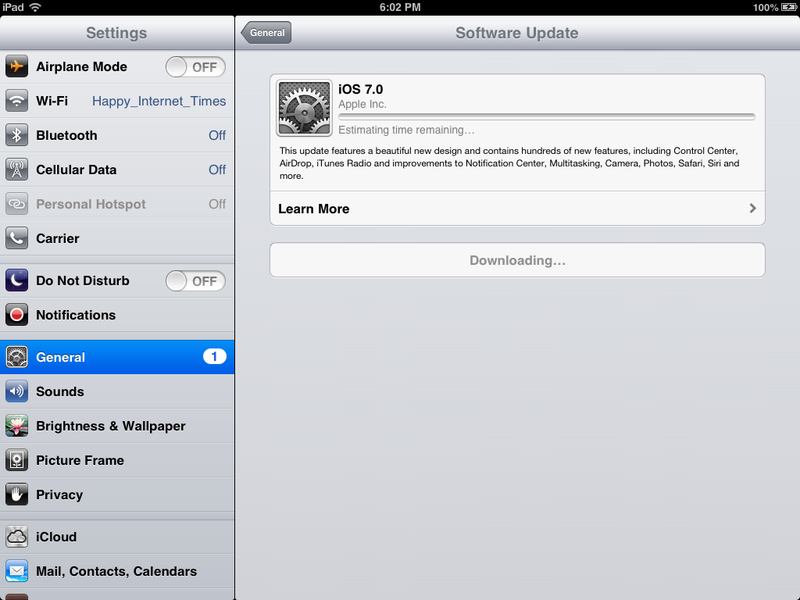 Apple could be facing lots of demand, so don’t be surprised if it takes a little while to find and download the update. The best advice is to just keep trying if you encounter errors. It’s always interesting to watch the adoption curve when Apple updates its mobile software, but this time around it should be even more so. Word of advice to those with less tech savvy friends and relatives who might be caught unawares with the update today: you could be fielding a lot of tech support calls. Rest assured that most of that will be due to shock, since overall iOS usability is actually improved with this update. You can also direct anyone you know tentative about the update to the User Guides Apple has published on the iBookstore. We’ll be checking in with the usual sources to find out more about iOS 7 update adoption in the coming weeks, so stay tuned.